After several days of reading I finally felt inspired to make a Valentines gift. It took a few hours but that was mostly because I sewed a gift pouch by hand. It was good practise and my stitches are getting more even. 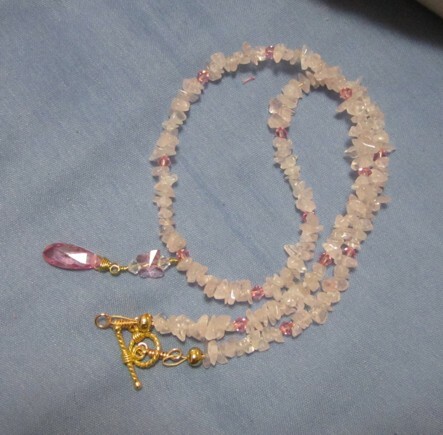 First I took a rose quartz chip necklace I had made and added a drop to give it more interest. Using two bicones a small crystal butterfly and a zircon pendant I wired them into a drop. It shows how even inexpensive chips can be made to look fancy. 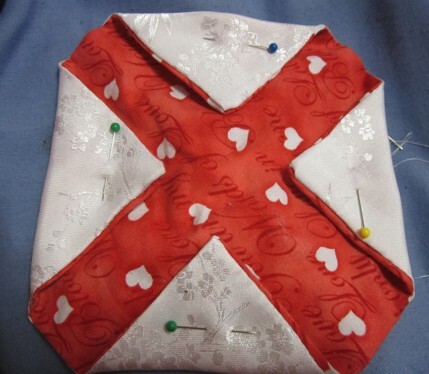 Then the present needed a pouch so I cut 2 8 inch squares from two different fabrics. The outside fabric was a Valentine cotton print and the inside damask satin. 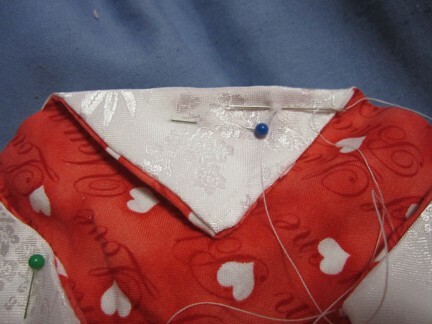 They were sewn right sides together using a 1/2 inch seam. Then leaving an opening the square was turn right side out. Using tiny stitches the opening was closed. Then with the outside square up the corners were turned down about 1 1/2 inches. This should have been a smaller turn down because the finished pouch does not close completely. Next the corners are sewn down at the top about 1/4 inch. 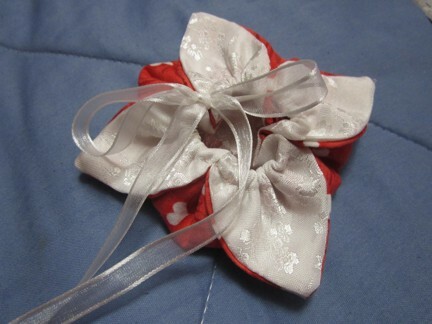 This creates a tunnel to run cording or ribbon through to close the pouch. Sewing down the pouch corner. Finally some white ribbon was run through the four sides and pulled to close. 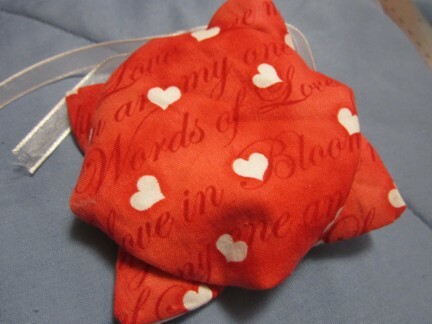 By using two different fabrics it now looks like a flower. Hopefully the person receiving it will like it!